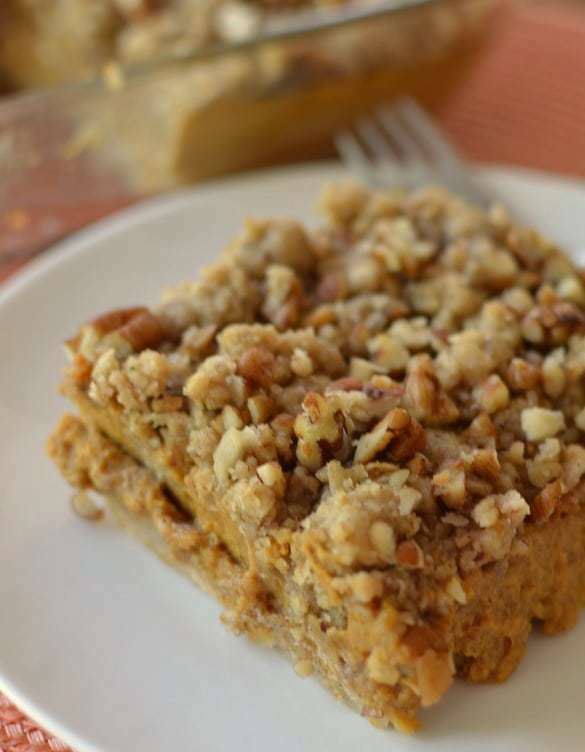 Crunchy Pecan Pumpkin Pie Bars start with a sweet oat bottom crust covered with a scrumptious pumpkin pie filling and topped with a pecan crunch. They are the perfect fall dessert. Well it is almost Labor Day weekend and that means fall is right around the corner. I purchased some of my mums from Costco and I am starting to make preparations for my favorite time of the year. 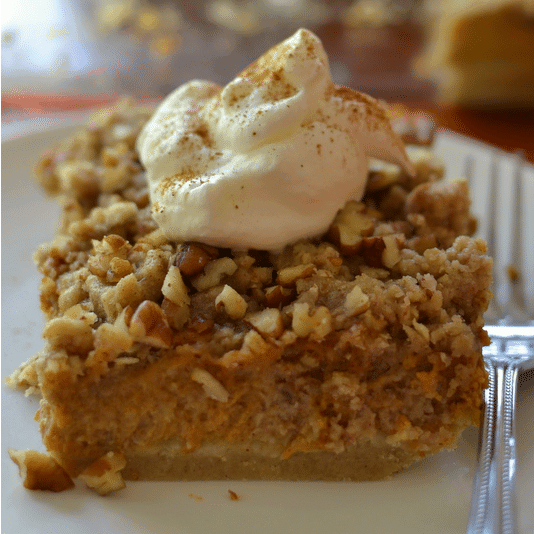 My blogging friends are baking all kinds of apple and pumpkin goodies to tantalize your taste buds. I sure as heck don’t want to be left in their dust so I have shaken off my June Clever apron (okay now I am dating myself) and baked these awesome Crunchy Pecan Pumpkin Pie Bars. I mean honestly who wants plain pumpkin pie when they can have it all dressed up? 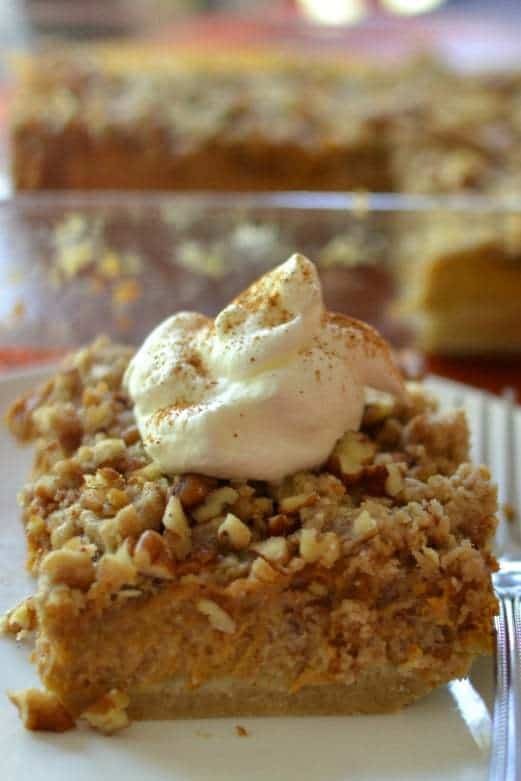 These delicious Crunchy Pecan Pumpkin Pie Bars combine a sweet oat bottom crust covered with a pumpkin pie filling and are topped with a pecan crunch. It can be made ahead of time but if refrigerated for than about 12 hours the top crust becomes more of a pecan crumble albeit still delicious. It is rich so a little goes a long way. You can even dress it up with a little whipped cream and a sprinkle of cinnamon. 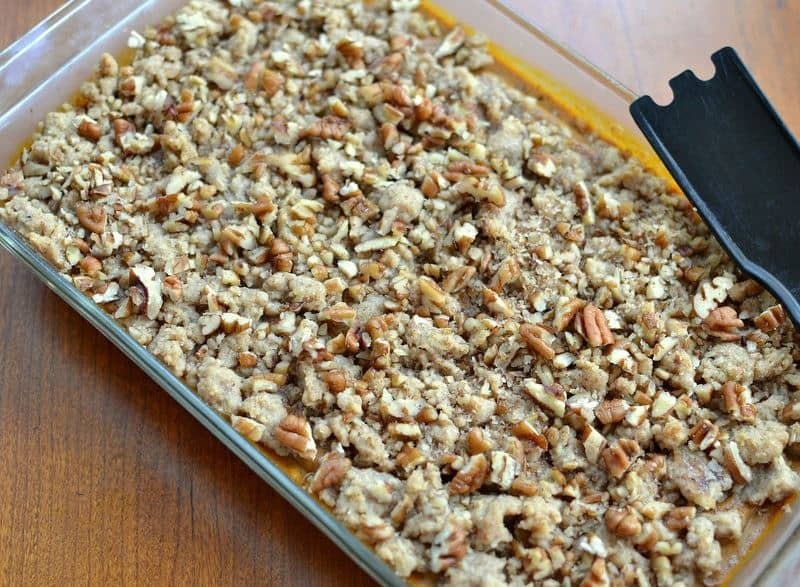 How do I make Crunchy Pecan Pie Bars Recipe? In food processor pulse together oats, brown sugar, flour and cinnamon. Pulse in butter a couple of tablespoons at a time until crust pulls together. Pat into bottom of a baking dish and bake. Mix together evaporated milk, pumpkin, eggs, pumpkin pie spice, sugar and cinnamon. Pour over crust and bake. Mix together flour, brown sugar, salt and oats. Cut in butter with pastry knife until crumbly. Sprinkle over baked pumpkin and bake again. Top with chopped pecans and chill. 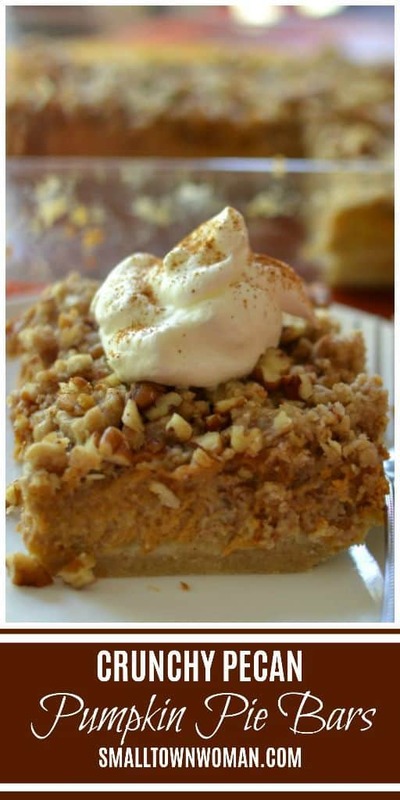 Other pumpkin recipes you will love! Preheat oven to 350 degrees and spray 9 x 13 pan with nonstick baking spray. In food processor pulse 1/2 cup oats, 1/2 cup brown sugar, 1 cup flour and 1/4 teaspoon cinnamon a couple of times to mix it. Add 1/2 cup butter a couple of tablespoons at a time and pulse just until it combines and pulls together. Pat mixture into the bottom of the pan and bake for 15 minutes. In large bowl mix together evaporated milk, pumpkin, eggs, pumpkin pie spice, 2/3 cup sugar and 1/4 teaspoon cinnamon. Pour over baked crust and bake for 20 minutes. In medium bowl combine 3/4 cup flour, 1/2 cup brown sugar, salt and 1/2 cup rolled oats. Using pastry knife cut in 1/2 cup chilled butter until crumbly. Sprinkle over top of baked pumpkin. Bake for 20 minutes. Remove from oven and sprinkle with pecans. Chill for several hours before slicing. For an added bonus top with whipped cream and a tiny sprinkle of cinnamon.